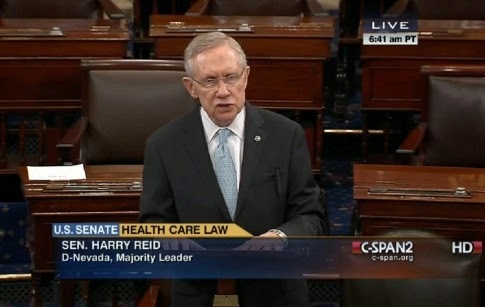 Harry Reid took to the Senate floor Thursday and used Kentucky's Affordable Care Act numbers as a stick to hit Mitch McConnell. That sounds like a great success, but Dingy Harry left out one key statistic. The goal of the ACA was to help cover 48 million Americans, including 640,000 in Kentucky, who lack health insurance. Final figures are expected from the state Tuesday. So far, about 80 percent of enrollees qualified for expanded Medicaid, leading some critics to question the added costs to federal budgets. The rest bought private plans on the exchange, where people are eligible for subsidies, based on their income. 80% signed up fro free Medicaid; proving once again free stuff is popular. That means only 72,000 actually signed up to pay. Most of them likely got a large subsidy. The 80% Medicaid number also explains why 75% of KY enrollees were previously uninsured. Most of these people were probably already "getting a check" from the government as they say in Eastern Kentucky.